In creating this meal plan, I discovered two gorgeous, delicious, meal-in-one-dish salads that earned a permanent place in our summer repertoire. Strawberry Quinoa Balsamic Salad is the answer to early summer’s juicy strawberries, and I love how the cucumber lends a refreshing kick. And then a Sweet Potato Mexican Black Bean salad, full of crunchy goodness, plus, you feel like you’re eating a rainbow. Except, you know, it’s not actually air. Rounding out the week are Grilled Cauliflower Steak Sandwiches, Firecracker Cauliflower a couple of days later, and on Friday, Red Lentil Tacos. Perfect for serving alongside a frosty margarita for toasting another week well done! Strawberry Quinoa Balsamic Salad from Cookie Monster Cooking // This salad just tastes like summer. With strawberries, mozzarella, basil, and balsamic vinegar, its caprese roots are expanded with the surprise addition of crunchy cucumber (it totally works!) all mixed in with a dose of satisfying, wholesome quinoa. Between the quinoa and the cheese, this one definitely qualifies as a meal-in-itself salad. A delicious one! Grilled Cauliflower “Steak” Burgers from Kitchen Treaty // This one’s from my blog, and I fully admit to being way too proud of the creation. This is a fun way to hop on the cauliflower “steak” bandwagon — or, if you’ve already been on the wagon for awhile, it’s a nice little variation. I like to use just the two center cuts from cauliflower heads (the slices attached to the center hold together better) and reserve the rest for another meal. In this case, we’ll have a use for the leftover cauliflower on Thursday. And trust me, it will be worth the wait! 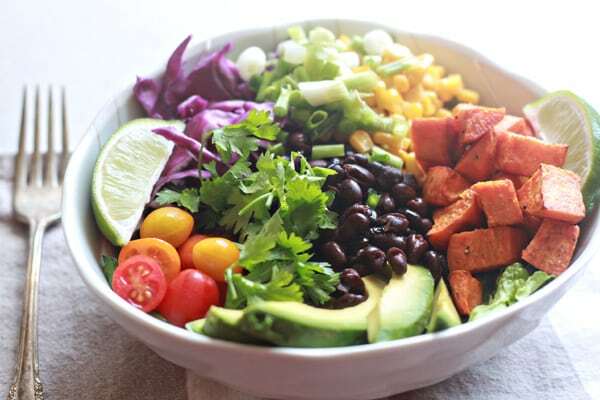 Sweet Potato Mexican Black Bean Salad from Two Peas and Their Pod // This is THE MOST SATISFYING salad. Seriously hearty. And delicious. And colorful! (I really liked this salad. Can you tell?) Black beans and roasted sweet potatoes give this salad a thoroughly satisfying edge. The creamy avocado along with delicious bursts of corn and tomatoes seal the deal. Firecracker Cauliflower from Oh My Veggies // When this recipe passed my desk, my jaw dropped. Could it possibly be any more mouthwatering?! Crunchy breadcrumb-coated cauliflower, baked until golden brown and served with a spicy-sweet dipping sauce. Add rice and this one’s another keeper. Red Lentil Tacos from Coffee & Quinoa // I’m breaking out of my “must have pizza every Friday!” rut, and what a way to do it! These lentil tacos are terrifically tasty and very easy to put together. Pretty much the perfect weeknight meal. I was surprised by how simple the red cabbage “slaw” is — but it totally works. If you don’t have a grill, you can still make cauliflower steaks — just roast them in the oven instead. Select medium-sized heads of cauliflower, and when you slice them down the middle for the steaks but set the rest aside, don’t fret the leftover florets! Remember, they’ll make a reappearance a couple of days later. If you’d like to save a buck or two, consider skipping the arugula in Tuesday’s burgers and use a couple of leaves of romaine instead. You’ll likely have more than you need for Wednesday’s salad. We included salsa in the shopping list for topping Wednesday’s salad; if you prefer another type of dressing or if you opt to make Two Peas & Their Pod’s Creamy Avocado Dressing, be sure to add those ingredients to the list! Wednesday’s salad calls for fresh or frozen corn. We’ve added the corn to the frozen section, but if you can get fresh, by all means, use that instead! When shopping for avocados, choose one unripe (hard) avocado, so that it will have a few days to ripen and will be ready by Friday! If, by Wednesday or so, it’s still pretty hard, place it in a brown paper bag, fold over the top, and let it sit on the kitchen counter. This should help speed the ripening process. For Friday’s tacos, try doubling the lentil filling portion of the recipe and freeze half in an airtight freezer bag for an even easier weeknight dinner down the road. Just remember to adjust the grocery list accordingly! I picked up cauliflower at the store yesterday to try the firecracker cauliflower from Ashley’s awesome blog this weekend. I can’t wait to give it a go! Love the idea of the sweet potato. That’s the classic side (served cold) to Peruvian ceviche, one of the best foods I’ve ever eaten. I’m making a change to be vegetarian and I wasn’t sure how to do it and make sure the meals were healthy, exciting, and complete. These recipes look like I can do it and accomplish my goals. Starting tho meal plan tonight!!! Thank you for making this life transition easy for me!! I am also making a change to become vegetarian, and was referred to your website for recipes. They look amazing and I am excited to try them out! Thank you for making it so easy to start my first week!